MOOCs aim to “educate the world.” More often than not, however, MOOCs fall short of this goal — a majority of learners are already highly educated and come from specific parts of the (developed) world. Learners from developing countries without a higher degree are underrepresented, though desired, in MOOCs. One reason for those learners to drop out of a course can be found in their financial realities and the subsequent limited amount of time they can dedicate to a course besides earning a living. If we could pay learners to take a MOOC, this hurdle would largely disappear. With MOOCS, this leads to the following fundamental challenge: How can learners be paid at scale? Ultimately, we envision a recommendation engine that recommends tasks from online market places such as Upwork or witmart to learners, that are relevant to the course content of the MOOC. In this manner, the learners learn and earn money. To what extent do online market places contain tasks relevant to a specific MOOC? To what extent are learners able to solve real-world tasks correctly and with sufficient quality? In this first study, we did not actually pay our learners (that would be a great follow-up though! ), instead we inserted “bonus exercises” drawn from paid tasks posted on Upwork into the MOOC Data Analysis: Take it to the MAX() (open for enrollment now! ), which teaches basic data analysis skills using spreadsheets (lookup and search functions, array formulas, named ranges, etc.). The MOOC is one of the more popular ones at TU Delft; in the 2015 edition 33,515 learners registered for it. Overall, less than 7% completed the course successfully - this may be hard to believe, but this is actually quite a good completion rate for this type of MOOC! As we aim to determine whether learners can solve real-world tasks that are related to the course material with accuracy and high quality, for each course week we manually selected one appropriate paid task from Upwork, limited to those paying between US $20-$50; we fixed these limits as we wanted the tasks to be meaningful but also solvable in a reasonable amount of time. We kept the task descriptions intact, let our learners solve the tasks disguised as bonus exercises and had a spreadsheet expert generate the ground truth solution against which we compared all solutions sent in by our leaners. We also identified a number of relevant code smells that we employed to measure the quality of the submissions. Are learners able to solve these tasks? Yes they are! Well, those that try at least are. In the table below, we show for each course week the number of active learners (those that are still following the course), the number of learners that submitted a solution to the weekly bonus exercise and most importantly, the number of accurate (i.e. in line with the ground truth) and high quality (no code smells) solutions. The progression through the course weeks is typical for a MOOC: in week 1 learners are still highly motivated and 16% submitted a solution to our Upwork-based bonus exercise, by week 7 we were down to 1% of learners. Interestingly, the accuracy of the solutions is not aligned with the amount a task pays - the two lowest paid tasks ended up being the tasks with the lowest percentage of accurate solutions. When we looked at the code submissions more closely we found that the lengthy task descriptions threw many learners off and they often missed one of the required data processing steps. Positive to mention is the quality of the solutions, a large fraction of the solutions exhibited zero code smells! How scalable is all of this? Does Upwork actually have sufficient tasks to support thousands of learners with course-relevant tasks? We looked into this question by taking a snapshot of all available tasks on Upwork on a specific day in September 2015 - this led to a total of 56,308 open tasks that we analyzed. 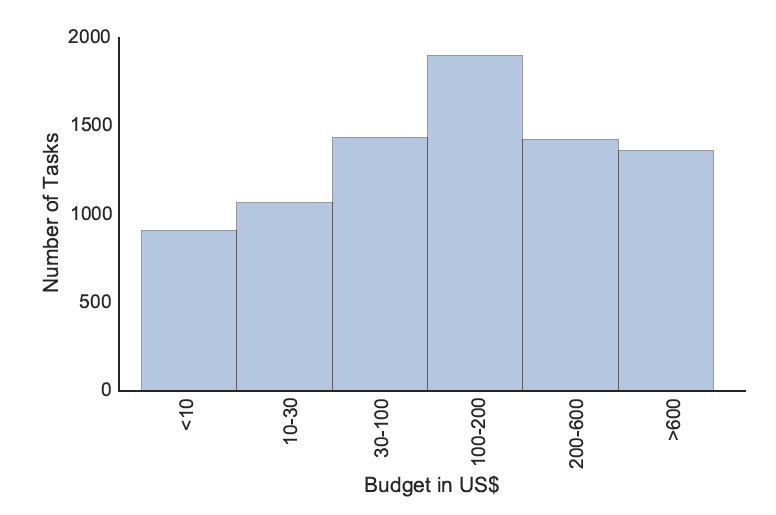 About 2,500 tasks fall into our budget range of up to US $50. However if we filter out all those that are not relevant to spreadsheets we are left with only 574 potentially relevant tasks in the budget range $1-$50. We manually labelled a sample of those tasks for their relevance to the taught MOOC material. Based on this labelling we estimate that for this particular MOOC and our budget constraints 11 relevant tasks are added every day to Upwork. This is better than nothing, but clearly not enough. In the future we will consider additional freelance platforms, tasks with larger budgets (which may be split across learners) and setups that will aid MOOC learners to take the first actual steps into the paid freelance task world. The journal’s preprint is available here.